Vegetarians can still enjoy traditional comfort foods like meatloaf by whipping together a variety of vegetarian meatloaf recipes. There are many vegetarian loaves to choose from, from vegetable loaves to grain loaves with quinoa, nuts and legumes such as tempeh. Textured vegetable protein, a soy product, will create a vegetarian meatloaf comparable to the meaty version. Add some potatoes and gravy and invite your friends to the feast. A medley of garden vegetables enveloped in eggs and cheese with a touch of bread crumbs or wild rice, complementing this recipe beautifully. The milk and eggs are easily replaced with vegan ingredient substitutions. Heat olive oil in skillet. Add onions and sauté until onions are translucent. Stir in diced zucchini and heat 5 minutes. Fold in the mushrooms, grated carrot and minced garlic; cook until the zucchini is soft. In a bowl, beat the eggs. Add milk or substitute, herbs, Worcestershire sauce; whisk together. Stir in the bread crumbs, or cooked wild rice, into the mixture. Fold in the vegetable medley; mix in the cheese. Season the mixture to taste. Shape the mixture into a bread pan. 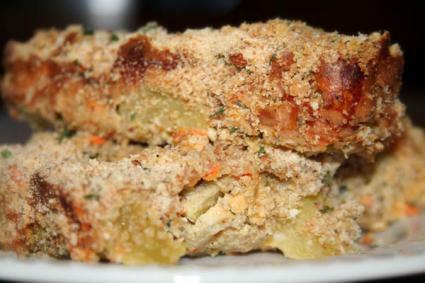 Combine Parmesan with breads crumbs and parsley; crumble the mixture over the vegetable loaf. Bake for 60 minutes at 350 F.
An exotic grainy loaf packed with mega-protein and a distinctly nutty flavor. Not only is it healthy, it is tasty and looks deliciously crunchy. Heat the olive oil in a large skillet. Sauté the onion, herbs and spices until onions are translucent. Add water, broth and quinoa; bring to a boil, reduce heat and simmer for 15 minutes. Add the cooked peas, carrots and remaining ingredients. Stir well. Form into a loaf and bake for 45 minutes at 350 F., or until the top is crunchy. Heat the oil in a skillet over medium heat, and briefly sauté the garlic and red pepper. Blend in the flour; cook until the roux is browned. Stir in the broth and simmer gravy 5 minutes. Add Worcestershire sauce or alternative, yeast extract, and pepper to taste. A savory rendition of classic meatloaf topped with onion gravy: Toss in some mushrooms and wine, and have a feast. Combine all ingredients into a large bowl. Mix ingredients until they are evenly blended. Pour the vegetable meatloaf into a lined container and mold it into the pan. Bake the loaf for approximately one hour at 350 F.
Melt one tablespoon of oil in a skillet and caramelize the onion and syrup. Add the flour and garlic; stir frequently until the onions are soft and the roux is brown. Pour the liquid ingredients into the skillet; simmer until the wine evaporates. Add the broth and simmer. Season the gravy and serve. Making gravy with your vegetarian meatloaf recipes adds the final touch bringing the whole meal together. Try a white, onion or brown vegetarian gravy - add a handful of nuts, herbs or mushrooms for a delightful twist. Whip up a dish of mashed potatoes and enjoy this traditional comfort food.